Each player draws an adventurer card that gives them a job to do in the rescue effort. Each adventurer has certain benefits listed on the card. Also listed on the card is the water carrying ability of the adventurer. Keep close track of water supplies. It can end the game if just one player runs out. Set-up the two-sided tiles (desert side up) in a 5×5 grid with the middle of the grid left empty. This empty spot in the grid will move around the board each turn as storm cards send it sliding. Each tile that moves gets covered in sand. Tiles have to be clear to be excavated (turned over to reveal the tile) so the game is spent battling against these ever-increasing sand piles. Each desert ship part is hidden in the tiles. To find each hidden part, players must excavate two tiles with the part image, determine where the x and y-axis of those two tiles converge, move to that “converging” tile and excavate there. There are two wells (very helpful) and one mirage (extremely NOT helpful) hidden in the tiles. It is important to excavate the wells quickly and keep those tiles clear of sand to aid the players in maintaining their water supplies. Thankfully, there are 12 equipment cards that are received after excavating certain tiles. These pieces of equipment can truly be lifesavers. The game varies each time it is played. The placement of the tiles is random, and the chance of which card will be drawn each turn ensures that no two games are the same. We found that playing the game with more players requires a greater need for cooperation and patience. Our family of four has played the game twice and lost both times. My daughter has played the game twice with a friend and won once and lost once. 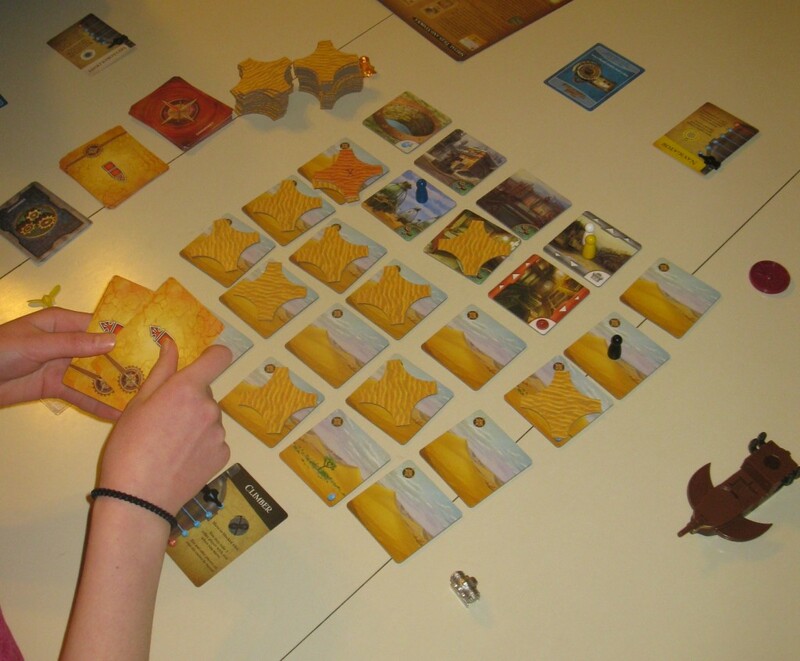 Click here to see our review on Forbidden Island – a similar game by the same makers.